Large number of Keralites living in Kuwait have a sleepless night here in Kuwait by the scary and unbelievable developments back home. Life has come to a standstill in Kerala. Floods, landslides and heavy rain have consumed hundreds of lives. Cries of help echoes from all corners of the state and relief operations continue on a war-footing. Many of the residents in Kuwait are worried about their home and relatives back in Kerala. "I am from Chenganoor area and the situation happening there is horrible. I am unable to connect with my family for more than a day now. My parents, brother and his family were on terrace during our last phone conversation on Wednesday. 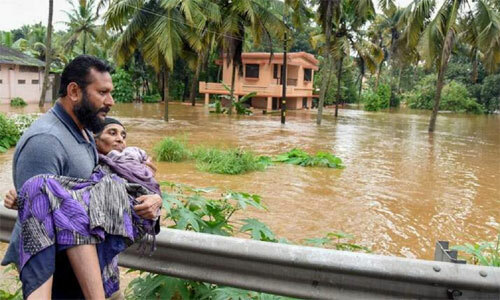 I am all prayers and hopeful that someone has rescued my family," said a Keralite living in Abbasiya. "I am in constant touch with my aged parents every few hours. Situation is very grim and all are nervous," another resident in Abbassiya said. The rescue operation is done through boats and there are many relief camps in our area, he said. "There is no electricity for last three days. I am charging my mobile phone using inverter," a friend whom this reporter spoke to last day told. However, from yesterday the friend is unable to reach on his mobile. As the government machinery and the public in Kerala are continuing tireless efforts to rescue the people who are stranded in flooded areas, many Keralite residents in Kuwait are also contributing their bit to the rescue operations back home. A combined meeting of all Keralite association is called for today (Saturday) evening at 6:00 pm at Abbassiya United Central School to review the situation and coordinate various relief operations based in Kuwait. Many associations cancelled their Onam celebrations and collecting financial contribution to the Chief Ministers relief fund. Friends of Kannur expatriate’s association, FOKE, informed that they cancelled their annual celebration scheduled to be held in September and decided to contribute toward Kerala flood relief operations. NAFO Kuwait, Kottayam Pravasi Association, Janatha Cultural Center, IMCC etc also informed that they cancelled their annual celebrations and will contribute towards the flood relief operations. Various associations already send their initial contribution towards the CM's relief fund. Money Exchanges Companies in Kuwait also came forward to support the Kerala flood relief operations. Al Muzaini Exchange informed that they will do the money transfer Free of Cost to anyone who wish to send their financial contribution towards Chief Minister Relief Fund. Lulu Exchange, Al Mulla Exchange, BEC also announced similar offer in Kuwait. The state government along with Kerala State IT Mission and IEEE has come up with KeralaRescue https://keralarescue.in – a website specifically designated for the relief and rescue mission in the state. The website also lists out details to contribute to the chief minister’s fund. Every small contribution made to the cause counts. You can also contribute online by visiting the site: https://donation.cmdrf.kerala.gov.in/ The donations to this account are exempted from income tax. Our heartfelt condolences on the sad and sudden developments in Kerala, due to floods. We pray for the earliest restoration of basic amenities and rebuilding of Kerala. It is great to know many of the Kerala Associations have cancelled the ONAM celebrations and decided to send a helping hand to rebuild Kerala, by donating to CM''s Flood Relief Funds. My Allah help kerala, this the lesson for us we are one we are indian. Please don''t go with dividing Politian''s. It is sad that a calamity of huge magnitude has struck this beautiful State. There were few videos which were scary especially the ones which shows land-slides. My heart goes for the people of Kerala and the State which is endowed with natural beauty. Sincerely pray Almighty that normalcy is restored at the earliest and all friends & relatives of the concerned are safe. Feel sorry for especially those away from their home place as the anxiety and concern is quite understandable. I hope that things get restored at the earliest by the Almighty''s grace. Hie, Can we know the status and update of this meeting? God Bless to the families of Keralite living in Kuwait.God give strength and ways to help/gathered happiness back for the Kerala State. God Bless My Country & State Kerala and save us from this Natural calamities.